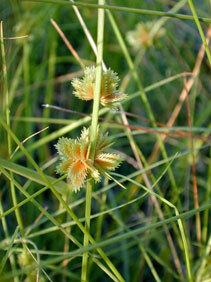 Also Called: Tape-leaf nut-sedge, sharp-pointed flat-sedge, taper-leaf flat-sedge. Culms: Erect, slender, triangular, usually straw-colored. Leaves: Blades few, basal, light green, equal to or slightly longer than culms, less than 1/10 inch wide. Inflorescences: Spikes, dense, spherical, 1/4 to 3/4 inch in diameter, borne on 2-5 rays .5 to 1.5 inches long or sometimes sessile; bracts 2-4, unequal, leaf-like, to 3 inches long, less than 1/10 inch wide, much exceeding inflorescence. Spikelets: Spikelets strongly flattened, ovate to oblong, to 1/4 inch long, closely overlapping, 10-40-flowered, radiating in all directions from common point; scales ovate, pale green, turning brownish with age, central nerve prominent; tips pointed, curving outward; stamen 1; style 3-cleft. Fruits: Achenes, oblong, 3-angled, pointed at both ends, yellowish brown, 1-seeded. Habitat: Low wet areas and edges of ponds, lakes, and streams.